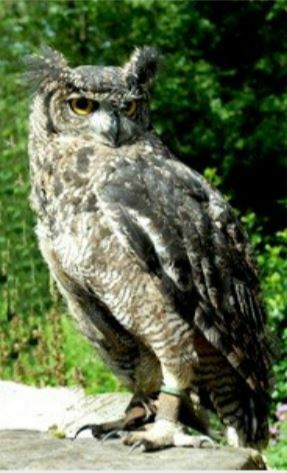 The African Spotted Eagle Owl is a medium to large owl with prominent ear tufts. The upper-parts are dusky brown with pale spots and the under-parts are whitish and finely barred. Facial disk whitish to pale ochre. They are largely found in Africa south of the equator, and parts of the Arabian Peninsula. Their habitat is mainly savannah, rocky outcrops, scrub, open and semi-open woodland, semi-deserts. This owl, lacking the size and strength of the great eagle owls , Bubo bubo is four times its size does not compete effectively in the struggle for the small to medium sized mammals. It rather specialialises in large insects, but does take some small mammals and small birds, and, on occasions, reptiles, scorpions, crabs, snails, frogs and anything else it can find. Studies in Nigeria have found this bird specialising in gerbils in woodland, and scorpions, beetles and reptiles in clearer areas. Around street lamps it snatches from the air insects, bats and even birds. Among the more surprising birds taken have been hornbills, sunbirds, terns, Many Spotted Eagle Owls die in traffic accidents and as a result of collisions with fences and overhead wires. Pesticide residue is also a problem with these birds in parts of Africa. If they can survive the first winter and avoid an untimely death, the likelihood of living for another ten years or more are quite strong.